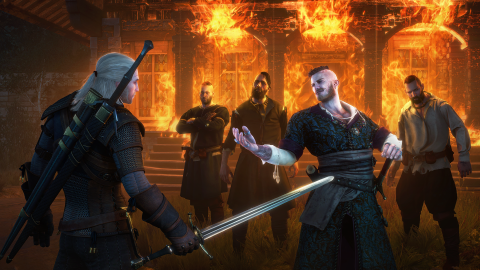 Since The Wild Hunt’s grand finale, I like to imagine Geralt has been pottering around Kaer Morhen, taking long baths, sharpening his swords and keeping his nose out of the toxic Novigrad Gwent scene. I haven’t touched the game for a while, but when I emerged into the Northern Realms for the first time in months a melancholy mood descended. The people I met and loved in the last adventure are getting on with their lives. Returning to The Witcher 3 is kinda sad for this reason, but in a lovely way. It’s a reminder how powerful the game’s narrative high notes were. What better way to reacquaint with pastoral Velen than a good old-fashioned monster contract? That’s how Hearts of Stone starts, with a seemingly routine appointment at the home of one Olgierd von Everec, a slightly dandyish cutthroat with a thing for imperfect sculpture. Soon enough Geralt is roaming the sewers beneath Oxenfurt, cutting through hoards of level 30 drowners and happening upon… well, it’s no secret really: you meet with Shani, a medic, scholar and love interest from the original Witcher. Olgierd von Everec wants you to slay whatever’s lurking in the sewers and, once you do, a whole new problem emerges: that beast was prince to a mysterious organisation called the Ofieris, who are not at all happy with your actions. Before you can Igni them to ash they’ve captured you. Those unfortunate events send Geralt haplessly towards the crux of the Hearts of Stone campaign: Gaunter O’Dimm (or the Merchant of Mirrors) helps you escape the Ofieris, but he’s none too happy with your taskmaster. Due to some arcane high fantasy reasoning though, the dubious O’Dimm is still bound to fulfil three duties for Olgierd and, well, that’s what you’re doing—helping him perform those three tasks or, as it turns out, doing them for him. Befitting a premium expansion, Hearts of Stone is a substantial addition to the main game, but it dares experiment in some subtle yet satisfying ways. Few of these experiments are mentionable here without major plot spoilers, but suffice to say the tone wavers between dread and deadpan comedy very gracefully, with one particular wedding sequence playing out like a stoner romantic comedy. These scenarios subvert Geralt’s steely and aloof personality, and what might prove tedious in a poorly written game works wonders in the hands of CD Projekt RED. While Hearts of Stone doesn’t add new regions to the Northern Realms, there are new locations north of Novigrad to explore, and these are populated with new fauna, side quests and random encounters. It’s the von Everec saga that matters most though, and while it has its lighter moments the general thrust of the story is quite bleak—family can’t be relied upon to stick by your side, self-interest rules the world, and any treachery can be justified by the allure of cold hard Orens. It’s Witcher 3 storytelling at its finest, but strip the characters and intrigue away and not much is left: boiled down to its gameplay core, Heart of Stones is a series of runnings to-and-fro. The combat is mostly the same, the boss encounters are visually stunning but tactically straightforward, and even the campaign’s heist centrepiece is largely driven by cutscenes. Meanwhile, the addition of Runewords and Glyphwords are likely to appeal to roleplaying completionists, but the stat and effect boosts they provide to gear don’t make a huge difference in practice. Much like The Witcher 3’s character tree, progression feels far too gradual, though if you’ve got an inventory full of unused runes you’ll have a lot to experiment with. In other words, there’s nothing about these new upgrade paths that feel essential, not yet anyway: they’re just new things to do. The Witcher 3 has an unusual problem to overcome: in a game with an abundance of sidequests most players will never experience, what’s the appeal of this particular one? I hear these concerns, and felt them going into Hearts of Stone. I enjoyed the 12+ hours I spent with the von Everec saga, though it did serve to reinforce some awkward truths about the core game, namely, that the combat and character progression really needs the epic scope of a 100 hour campaign to sustain them. Oh, and there really is a lot of running back and forth in this game, isn’t there? As a new self-contained saga though, Heart of Stones is unparalleled RPG storytelling. Just make sure you bring an investment in the fantasy.